You’ve seen Mike Wilkes at Fayetteville State University football and basketball games. He’s not hard to notice. He’s tall. He has moves that would make any contestant on “Dancing with the Stars” pea-green with envy. He can turn flips and tumble like an Olympic gymnast. And he’s blue. It's likely that you have passed Wilkes on campus, but didn't know who he was. He can be quiet and unassuming. Some might even say that he's a bit timid and shy. If it wasn't for his 6-8 frame, he just might go unnoticed. One might say that his anonymity is almost reminiscent of that of a superhero. By day, he's a mild-mannered college student with aspirations of one day becoming a TV cameraman. But when it's time for an FSU sporting event and he puts on his blue body suit, he transforms into a crowd energizer that makes children scream and Broncos fans get out of their seats. Wilkes is the Blue Man for FSU athletics. Let's get to know him a little better. I was born in Wilson, N.C., but moved to Fayetteville, N.C., at 4 years old. I have 3 sisters and 1 brother. I went to Douglas Byrd High school and graduated in 2008. What was life like for you while growing up? Many people do not know that I did not come from a good background, but a troubled background. When I say that, I mean I was always getting into trouble but not getting caught. I joined a well-known gang here in Fayetteville where we got into many fights and shootouts. I sold drugs just to make ends meet while working two jobs, because I didn't want to see my mother struggle with bills. Cumberland County had a major cut down on school positions and my mother was left with only being a teacher assistant and that cut her pay down to the point where we were struggling to pay bills. Because I wasn't making enough to help with the major bills, I got a second job and started selling drugs to help. It wasn't something that I wanted to do, but I had to make something happen. I started getting into more and more gang activity and started losing many of my close friends and relatives. It really took a toll on me to the point where I started getting depressed and having flashbacks. So, I knew I had to make a change and change my surroundings. As I got older I was still losing my loved ones. I became depressed to the point that I attempted suicide twice while being here at FSU. My close friend, who I call my brother, committed suicide on July 9, 2017 and I found out four days later. I felt so lost and my actions and mindset changed. I became a loner, stopped communicating with my peers, and I was having anxiety attacks. I was sitting by myself in the corner every day. I couldn't sleep and lost my appetite for three weeks. I found a release to get over depression. I put my emotions into songs. I started doing music going by the name "DatBoiReek." All the songs that I have made have meaning to them and they are about events in my life that I have dealt with. I worked at the Boys and Girls Club (BGC) but before working at BGC, I played professional show basketball with the Harlem Ambassadors, which was like the Harlem Globetrotters but no affiliation. I played three seasons with them and traveled to 45 states and to Canada by playing with the Ambassadors. Different organizations such as Boys and Girls club, Kiwanis Club, Lions Club, United Way etc., brought us out to their communities to raise money by coming out to the schools speaking to the kids/teens about the importance of education, life, right and making the right decisions. Basically, we shared our testimonies with everyone and how we changed and got over our obstacles. I chose FSU because I wanted to stay home to get my education and I got tired of bouncing around from city to city and state to state. Once I got off the road from playing basketball, I was taking summer classes at Sandhills Community College and I kept saying to myself how much I wanted to get back into a four-year HBCU and that if I get accepted into FSU, I will not go back on the road to fulfill my dream of being a pro ball player. I remember calling my dad asking him if I was making the right choice and my dad told me: "Basketball will always be there, go get your education." I never listened to my dad's advice before, but something in the back of my mind was saying LISTEN. Once summer school was over I sent my transcript in and got a letter back from FSU in like two weeks stating I was accepted. So, I sent a group message to my team telling them my options. They were excited for me because I was going back to get my degree, which everybody on my team had, except for me. I am a Mass Communication major. My favorite professor is Professor Hawkins. I like to hang out in Dr. Miller's office (cheerleading coach Dr. LaWanda Miller) and The Mac Lab. Dr. Miller's office allows me to sit, relax and clear my mind from time to time. I like the Mac Lab because I love working on my editing skills. How did you become the Blue Man and what do you like most about it? 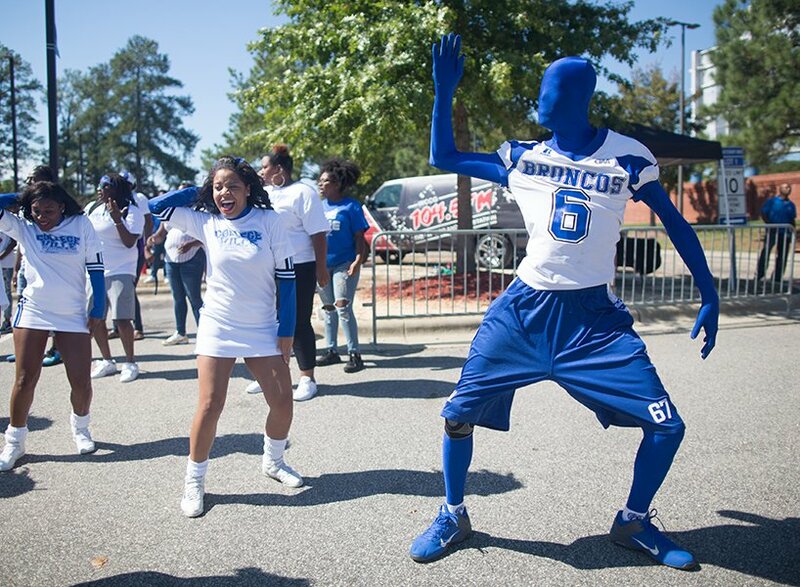 It was Dr. Miller's idea for me to be the "Blue Man" because I was too tall for the Mr. Bronco suit. I told myself since I entertained over 100-plus cities and 45 states, why not try to entertain at home, so I started asking around who do I speak with about being the school mascot. They told me Dr. Lawanda Miller and they escorted me to her office. She gave me an audition date and I came in to the audition which was at the Blue and White football scrimmage. I took over. I was doing backflips, dancing, showing my inner child and just having fun. Right then and there, Dr. Miller and Cheer Phi Smoov fell in love with me. I like the excitement and entertainment I bring to Fayetteville State and the community. It's an amazing feeling knowing, and hearing people mention the mascot and his work without them knowing the identity of the individual. What has been one of your most memorable moments? I won my first award ever, which is the 2016-2017 Coach's Award. That was the greatest feeling ever. I wasn't expecting that at all. I went to many elementary and middle schools to do community service work dressed as the mascot. Dr. Miller started getting plenty of requests asking her to bring the mascot. The word that principals were sharing about the mascot is that he is funny and energetic. My plan is to become a camera operator for ABC 11 News or any news station in North Carolina, open my own boys mentoring program, tryout for the Charlotte Hornets and the Greensboro Swarm, which is the new National Basketball Development League team, and marry my beautiful girlfriend.